Send your print jobs to the library's printers from anywhere you have an Internet connection. Is your printer out of ink or paper? Do you have a document on your laptop, tablet, or phone that you need printed now? Log in to the MobilePrint site with your library card number and PIN or your Access card (10 digit number with no password). Click the Upload icon (upper left side) to upload your document(s). Select a printer location (see Destination search box in the lower right corner) and click print. 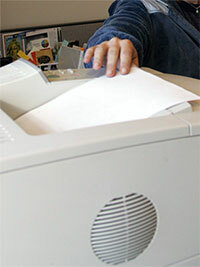 Go to the printer at any library location and log in and print your document(s). Email your document as an attachment to mobileprint.deschu01@gmail.com. Check your email for the status of your document(s). Click the link in the email and you will be taken to the MobilePrint website. Log in to the MobilePrint site with your library card number and PIN or your Access card (10 digit number with no password). You will see your document. Printing/copying is available at a cost of $.05 per black & white page and $.25 per color page.